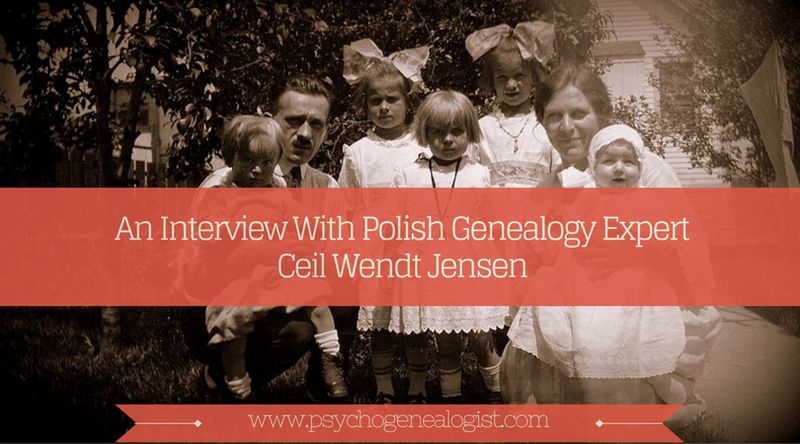 In a previous post about how to use Facebook to Boost Your Genealogy Research I told of how I met Ceil Wendt Jensen. She is an internationally renowned expert in Polish Genealogy. She was gracious enough to answer some questions about her professional and personal story. Tell me about yourself and your genealogical background. I grew up in Detroit, Michigan surrounded by my Polish-American family - my maternal grandparents, aunts, uncles, and cousins. I shared my parents with four siblings. My Catholic education at Epiphany Parish and Immaculata High School gave me a good foundation for my studies at Michigan State University. I received both my Bachelors and Masters degrees at MSU. Further studies were undertaken at Wayne State University for a Social Studies teaching credential. I relished my professional career as a studio art and art history high school teacher. Eventually, I segued into integrating digital technology and developing a curriculum for multicultural exchanges. I took an early retirement from Rochester Community Schools and enrolled in workshops and seminars in professional genealogy. My practicum included research in archives and parishes in the United States and Poland. During this second career I lectured extensively in the US and Canada, chaired seminars for FEEFHS, PGSM and UPGS including Salt Lake City, Utah and published webinars and books documenting Polish heritage. Along with co-director Dr. Hal Learman, we established the "Polonica America Research Institute". During our tenure at Orchard Lake our grant proposals received funding from the Michigan Humanities Council and Motor City Heritage to offer programs that guided families to document their Polish roots. Three of our publications "The Polish Panorama, Polish Studio Portraits, and Sto Lat: A Modern Guide to Polish Genealogy were distributed during these programs. Researching and appearing on "Our Polish Story" and "Genealogy Roadshow" helped me deliver on my goal of bringing Polish genealogy mainstream. How did you first become interested in genealogy? Was there a “moment” (or story) when you knew you were hooked? My interest in genealogy was piqued by a grade school assignment to interview a parent. I asked my Dad about our Wendt roots, and he showed me a cloth wallet that contained three documents his father had carried from Europe. I was mesmerized by these old documents. I was surprised that they were written in German since we were "Polish". (My parents used Polish as a secret language in front of us to privately discuss family matters). My father died suddenly a few weeks later. I started asking my elders on both sides of the family about our history. While I collected stories and some photos and documents, I didn't know what to do with them until years later. What is the best advice you have ever received about doing genealogy research? When I was transitioning from teaching to genealogy, I was fortunate to hear W. Hoffman, Fred, speak about working with documents in Polish, German, Latin, and Russian. He spoke about identifying the words and phrases you needed to undertake the research and said while fluency in the languages would be beneficial, it was not required. That was a great relief. Once you understand the structure of the records (rubric) and what information was being captured by the church and state, it became easier to understand what was available and where to look. What are the indispensable genealogy research tools that you use most often? Fred's books have a place of pride on my bookshelf. And, while everything is NOT on the Internet, I do have favorite sites I use on a daily basis. I might add that the system we use for Polish genealogy is the same steps you would use for any ethnicity. You begin with the American documents and work your way back in time. So, for the American documents my go-to databases are FamilySearch.org and Ancestry.com. (I am happy to say both sites feature several of my recorded lectures and articles). Regional databases for Internet include SeekingMichigan.org and Detroit Free Press archives. What have you learned about yourself through studying your ancestors? It is comforting to learn your history and name your ancestors. Losing my father at an early age (14) was tough. Even now, over fifty years later, I feel connected to him while I work on his history. And, in regard to the search for my grandfather's biological father, I was startled the other day to realize he died over forty years ago. I like the feeling of family unity I get when I do the research and tell their stories. When I started I was part of the youngest generation and now I have great nieces and nephews. I enjoy preparing materials for them to discover years from now. The Psychogenealogist explores the spaces where psychology, genealogy, and history converge. Do you have any thoughts or insights about those spaces? I have always been interested in social history, rather than studying from a military or political slant (though that must always be kept in mind). So the push and pull of migration, the role of women in the culture such as the Midwives, and the arts and crafts of heritage are my domain. The projects which were undertaken while on campus underline this interest. We did a fundraiser to refurbish the "Polish Panorama" which is a moving pageant of 106 figures of historical men in women from Polish and Polish American history. The figures are dressed in historically accurate clothing with a segment of figures dedicated to the regions of Poland that are most represented in North America. Our Vintage Photo Studio exhibit and publication captured the metro Detroit immigrant families in the cycle of life, from "cradle to grave". Are you currently working on any “brick walls” in your own genealogy research? How’s it going? I have two brick walls that I'm slowly whittling away. Both will most likely be solved with DNA testing. The first is to find the birth family for my paternal great grandmother Paulina Stelmach Wenta. Finding her birth date is holding up placing headstones on the graves of my great grandparents and grandparents at Mount Olivet Cemetery. I set aside the royalties from my Arcadia publications for this tribute. Paulina seems to fit into the family of Stanislaw Stellmacher and Marianna Kilichowska in the village of Mühlbanz, Dirschau, Westpreußen. My research at the archives in Gdansk (and the work of two fellow researchers) has not located any documents. But in late 2016 a young researcher had posted a family tree that includes this Stelmach family. Her grandmother would be my third cousin, which may show up in autosomal testing. The second brick wall is about my maternal grandfather, Antoni Przytulski's birth father. Antoni was born in 1890 in Russian Poland. He never told his children his paternal surname and the family has used his mother's maiden name for over a century. One of my male cousins was willing to submit a Y-DNA test and we now have a match! I am cautiously moving forward with research on both sides of the Atlantic since the Kursza line has members not only in Poland, but Detroit, Michigan. I hope that a Michigan Kursza will accept my offer of complementary research and testing. The Michigan family lived within walking distance of my grandfather and comes from the same village as the dna match. Pretend you have a month of fully funded genealogy research time. Where do you go and what do you do? This is a great question to savor. I’ve already spent the time and funds three different ways! Since it seems that I have just identified my grandfather’s male line after searching for 45 years, I naturally would like to document it as thoroughly as possible. So, I’ll spend the time and money on a research trip back to Poland. I visited nearby archives and the parish of his baptism on an earlier trip, but did not know which male surname to pursue (records did not record the name of the biological father if the couple were not wed). I’ll prepare ahead of time and start a dialog with the parish, since three hundred years of records are still at the parish. There are no microfilms nor scanned records for this parish, so my translator will need to arrange appointments at the rectory so we can review the sacramental records. I will find out who the estate owners were in the area to see if any record books still exist. I will also bring copies of pedigree charts and photos to leave at the archives and parish. And, as a good luck charm, I’ll pack gifts for the new family members I hope to meet. Please check out some of Ceil's wonderful publications over at Michigan Polonia: Polish Genealogy and Family History. And, as always, if you like what we are doing here at The Psychogenealogist please consider sharing with a friend and subscribing to the mailing list.